Comes with BONUS rosette pin! Fab geometric design skirt in a rich purple. Lovely weight ~ cotton duck. 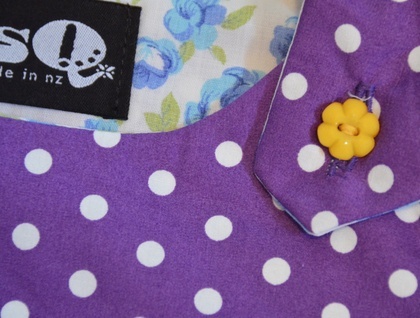 Together with a purple/white polka dot bodice, fully lined in soft cotton sheeting. 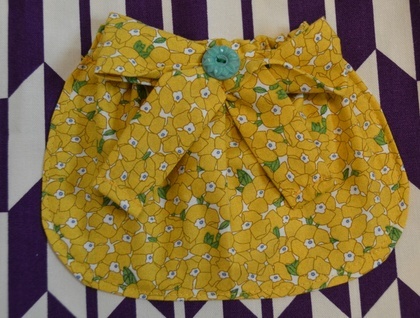 Floral mustard contrast fabric used for the large elasticated-top patch pocket on front, topped off with a fabric bow on top of pocket with a cute wee green retro button. 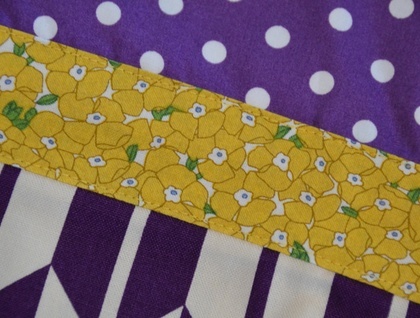 Finishing touches of 2 yellow flower buttons at shoulders and mustard floral waistband/tie. Can be worn as is or with stockings and long sleeve top in cooler weather. Sizes similar to pumpkin patch. MADE TO ORDER IS WELCOME!! Please message me through Felt. Inspired by 1950's, 1960's, rockabilly, high tea and cupcakes, colour mixing, sunshine, ric rac, polka dots, Scandinavian prints, vintage linen, rosy cheeks and pigtails. Hi :) I'm a fashion designer/patternmaker making all kinds of bits and bobs in my little workroom... I guarantee all my items to be one offs and never to be made again. I have a wide collection of funky and vintage fabric to ensure your child will be the funkiest wee chicken out there. I can make to certain requirements.... colour/size etc. Feel free to ask questions. Go on... check out my other garments!! 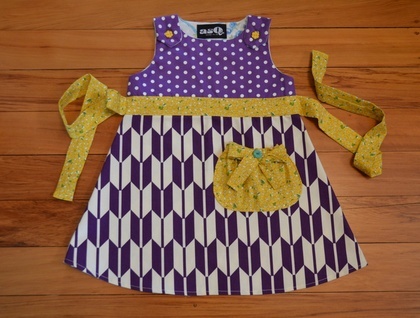 Jackets, dresses, shirts and skirts for ages 1 through to 5 years of age. Few adult skirts also! Contact asqdesign to enquire about payment or shipping options. Paisley makes me smile and florals make me dance.